In the middle of the 7 million acres of “forever” wilderness, visitors to New York’s Adirondacks can discover the small town of Lake Placid, New York. Popular for hosting two winter Olympic Games (1932 and 1980), the town is most notable for the Miracle on Ice, but I discovered more than just Olympic History. My short winter weekend gave me a chance to learn more about the town too. 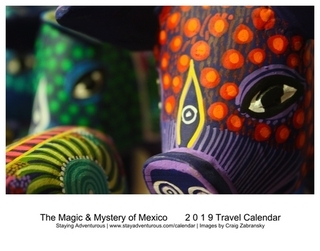 Here is what I discovered described through my five photo series. A Sunday stroll down Main Street, with a light snowfall, proved delightful. The charming shops, cafes, and bars offer a chance to take a break from the cold, but also learn the history of the region. The street also had a lookout point to allow pedestrians to stop and view the lake and landscape. During my time there I even watched a dog sled cross the frozen landscape. 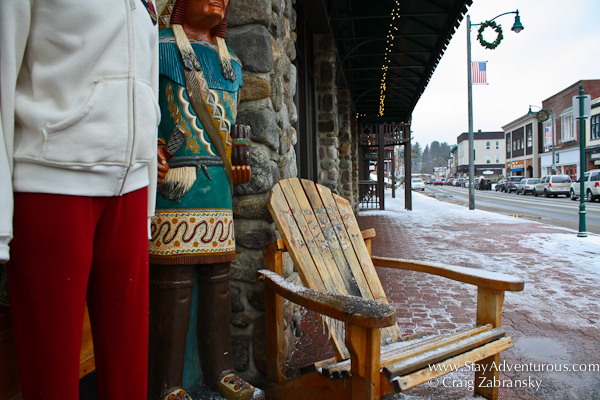 Yet, the standout moment during my stroll was capturing a photo of the Adirondack Chair, I was in the Adirondacks after all. Yes, I took my flag to Lake Placid. 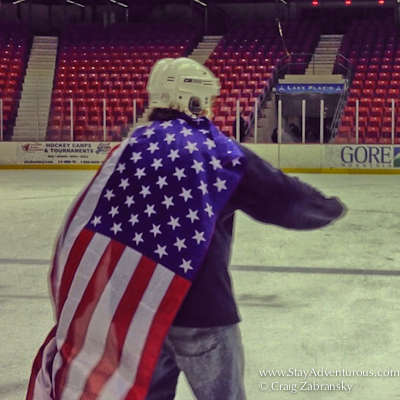 Old Glory came with me for one main reason – to drape my over shoulders as I skated on the ice at Herb Brooks Arena. Yes, I skated on the very ice where the miracle happened in 1980. In my childhood I watched the game and can remember the feeling of our “miracle” victory over the dominant Soviet squad; we defeated the USSR. It started my appreciation for the Olympics and hockey. That flame is still shining bright. As much as I loved the ice and my moment, my friend Francesca may have loved it even more when she skated on the miracle ice, but make no mistake I had chills; chills not caused by the cold arena or the ice. Close to the charm of main street, visitors can stay at a “castle.” Well that was the original plan by an former Olympian (and luger) who traveled through Europe competing and noticed that each winter sports destination had its “castle” with luxury accommodations. He never stayed there, but wanted Lake Placid to have one too. The Whiteface Lodge wasn’t open for the ’80 Olympics as his dream just became realized a few years ago, but is as close to a modern day castle with royal amenities and hospitality as you’ll find in the States. Even if you don’t stay there, consider a visit for its impressive cocktail list (try the Campfire), dinner menu and Spa – all open to the public. We spent plenty of time there. The Community Supportive Agriculture (CSA) movement was great to learn about. Even better when the chef came out to explain it and how the restaurant uses it. The concept is simple, locals pay a farmer for a share of the farm’s produce. The farmer knows his costs are covered and the community gets fresh, locally raised (and delicious) farm products. Win-win-win. Win for the farmer, win for the local establishment or citizen who receives the products and win for the person who eventually eats the food (like I did). Generations, the main restaurant at the Golden Arrow Lakeside Resort (where we stayed), described CSA and the resort’s farm-to-fork sourcing over brunch. The chef prepared a special menu. 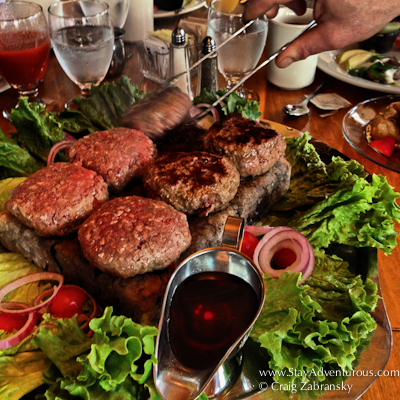 The stand-out dish was a local grass-fed bison burger cooked on a Himalayan salt block and then doused with a special local NY maple syrup sauce. Delicious. If you ask which Winter Sports in the Sochi Olympics, or any Winter Olympics I am excited to watch – Luge and Ski Jump. It’s a no-brainer for me. Yes, I love many events, but I think those athletes are insane in a wonderful way. Well, with a special invite to the USA Luge training center I met Olympian Larry Dolan who taught me how to start on a luge sled. I now can confirm the insanity of sport. You can’t see anything except your peripheral view. All I noticed after I opened my eyes, after the initial fear subsided, was a white icy blur and all we did was travel a few meters off a practice start. With such training facilities in Lake Placid, and such a Winter Olympic Heritage, many Olympians come from this region of New York and some are competing in Sochi. Visitors to the Adirondack can enjoy many Olympic moments and create their own with a Bobsled run, the view from the top of the Ski Jump, the Olympic Museum filled with its history and more. Yes, I discovered Olympic heritage in Lake Placid making me even more excited for the 2014 Sochi Winter Olympics, but I also discovered a bit more. I discovered an entry point to authentic Adirondack adventure. It is a place where winter sports are not just for Olympians but available to everyone and a place filled with adventurous spirit for all four seasons. I’ll be back. 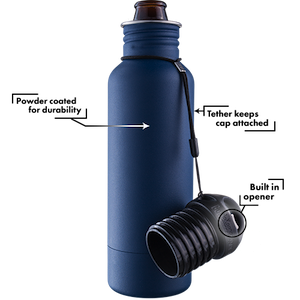 This is part of the five series, a series designed to tell about a location through five photos. Also, special thanks to Lake Placid Adirondack for facilitating my stay in the Adirondack town. 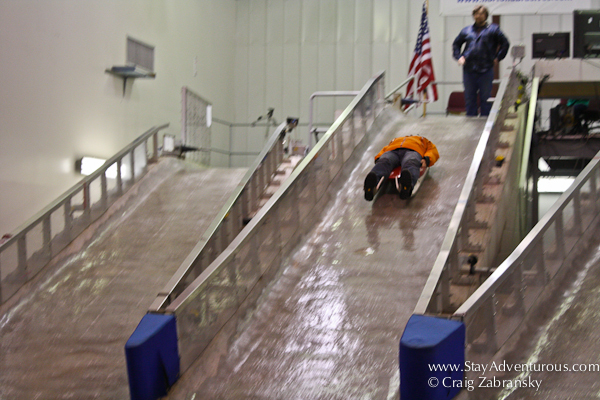 Look at the form as I went down the luge start ramp! 2018 Olympics, here I come!! 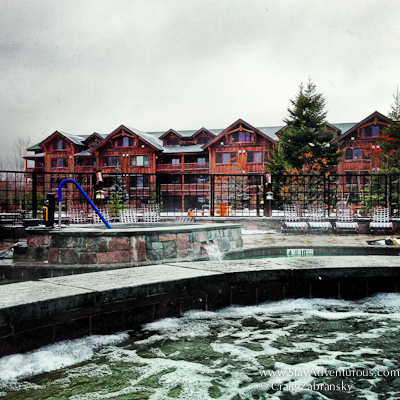 The Whiteface Lodge was VERY impressive. Would love to return and stay there! This just took me back to one of the best weekends (and not just one of the best of 2014). I had so much fun, and while Lake Placid has been special to me since I first visited, my trip with you three made my connection to the town even stronger. Can’t wait to head back for some warm weather fun!! Craig, you really did stay adventurous – kudos for testing the luge and what a sweet sentiment to your flag out onto the ice… well done, all around. Thanks Maria, i appreciate it. The Luge and the Flag Skate really got me into the spirit of the Winter Games… Some year I need to go watch the Olympics live, maybe they will return to Lake Placid one day.